I interrupt this stream of lentils to give you something chocolate. And peanut butter. 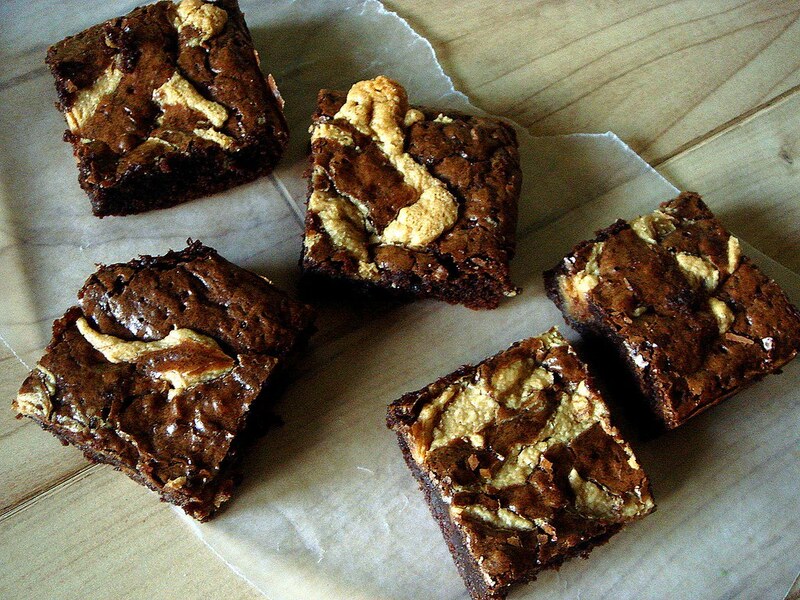 A while back I made these brownies, a Martha Stewart recipe, because I liked the way the peanut butter swirls sounded. Not just peanut butter, but a sort of thinned out frosting consisting of a bit of butter, confectioners' sugar, peanut butter, salt, and vanilla extract. The topping was delicious, and I was anticipating a fudgy brownie with a salt peanutty swirl. Unfortunately, the brownie came out cakey, most likely due to the baking powder in the recipe. It wasn't the experience I had hoped for, so I slowly erased it from my mind, one bite of brownie at a time, followed by a guzzle of cold milk. On Tuesday it was raining and somewhat chilly all day, which obviously was perfect baking weather. 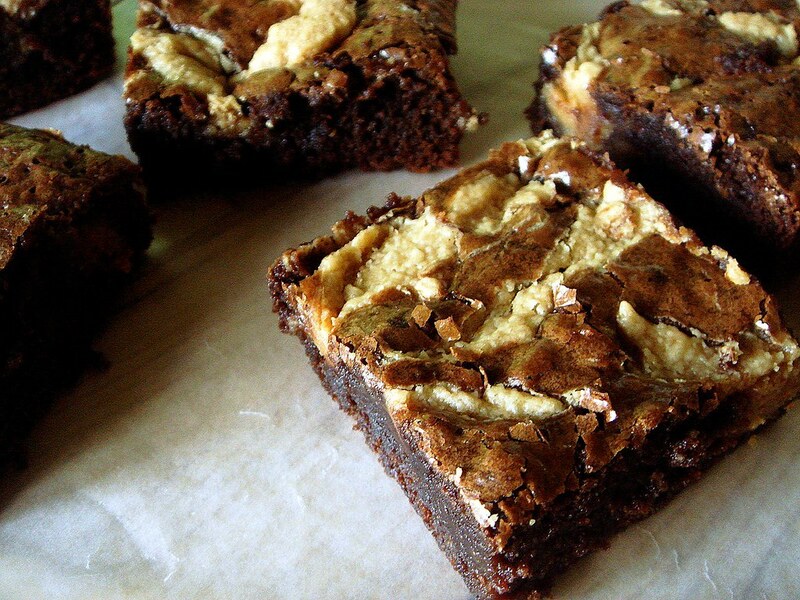 That day, I thought again of the peanut butter swirl brownie, and I decided to make them the next day, but with a few tweaks. I found the recipe on another blog, and she felt the same way about the cakey outcome as I did. She made a secondary version, replacing some of the regular sugar with brown sugar, so I followed suit. I also added a tablespoon of espresso powder to the flour, nixed the baking powder, doubled the salt, and added 2 ounces more chocolate. I was going for broke in the form of ultimate fudginess. To the peanut butter layer, I thinned it out a bit with some milk, though it was still a little difficult to swirl, so I'd probably use a little more next time. In the version she made, she used natural peanut butter. Good to know it works if that's all you have, so don't fret -- you can still make brownies! Brownies are so quick, much quicker than cookies to whip up, and make the perfect last minute dessert. If you're rushed for time, make these brownies and get ready to be praised. Preheat oven to 325 degrees. Butter a 9-1/2 or 10-inch square baking pan and line with foil, allowing a 2-inch overhang. Grease lining (not overhang). Make batter: Put butter and chocolate in a medium sized pot over medium low heat; stir until melted. Let cool slightly. Whisk together flour, espresso powder, and salt in a bowl. Whisk sugars into chocolate mixture. Add eggs, and whisk until mixture is smooth. Stir in vanilla. Add flour mixture; stir until well incorporated. Make filling: Stir together butter, confectioners' sugar, peanut butter, salt, vanilla, and milk in a bowl until smooth. Pour batter into prepared pan; spread evenly with a rubber spatula. Drop dollops of peanut butter filling on top of batter, spacing about 1 inch apart. Gently swirl peanut butter filling into batter with a butter knife, running the knife lengthwise and crosswise through layers. Bake until a cake tester inserted into brownies (avoid center and edges) comes out with a few crumbs but is not wet, about 30-35 minutes. Let cool slightly in pan, about 15 minutes. Lift out; let cool completely on a wire rack before cutting into squares. Brownies can be stored in an airtight container at room temperature up to 3 days. Very perfect served with whipped cream. I'm not such a cakey brownie person either..I want mine to be thick and fudgy. I'm totally enamored with the PB topping on this. Nothing says good dessert like a PB topping. I'm not sure if I like cakey or fudgey brownies better. I'm leaning towards the latter, though I don't like them SO fudgey that I think I might get salmonella poisoning from undercooked eggs. That reminds me, I finally bought a copy of "The Final Call" sold by those guys on the street corners. I've been meaning to for years, but I got around to it last week. Anyway, all these bean stories reminded me that when I bought that paper, those guys (or at least some) also sell bean pies. those look amazing! i'm glad you altered the recipe to your liking...besides, i'm not a fan of martha steward...arg...something about her erks me!